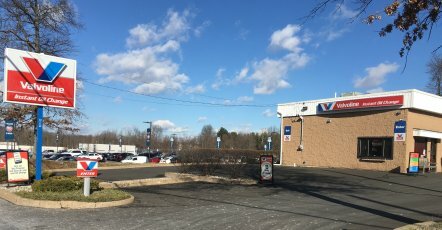 I was worried about my car probably needing to have its oil situation checked out before my kind of long drive home, and two guys where I was recommended the Valvoline right in Doylestown a couple minutes away. I had never used any kind of "instant" preventative car care. This service was great! It gave me peace of mind, gave m confidence that I would get home without issue. The car was 2 to 4 quarts low on oil and had some leaks that they said aren't surprising for my car's age. And all the other things they checked out which I didn't expect AND were included :) They discovered a brake light out in my back window (there's zero chance I could've discovered that on my own) and that the washer fluid jug is cracked and leaking if it's filled too much. I'm very glad that's where I went. Knowledgeable, friendly service and good at explaining what and why they were doing what they were at each step. The peace of mind and relief I left there with is priceless. Thank you very much. Carlos is very professional, knowledgeable, and friendly. His service was BaLLiNnNnNnN! The service workers are extremely polite and caring of you and your vehicle. They are very communicative with what they are doing when they service your car and you feel you can trust them when they tell you positive and negative things about your vehicle. Carlos gives great customer service. Service was quick n staff were friendly. It is fast and easy and sitting in my car I think it takes less time to complete the oil change. I had a terrific experience. However, it’s a bit overwhelming to be responsible for customers driving themselves into the garage. I thought Carlos did a great job! He was bery nice and seemed very knowledgeable! He explained everything he did as he was doing it! The service technicians that were working on my vehicle were very friendly and had personable character between each other and with me. I never thought I could have fun getting my oil change! I had a good time talking with Carlos and the whole Valvoline team. They are all great and when I need more service, I’m definitely coming back to see everyone! Staff very friendly. Also you can see that the job has been done. Good value for the price and the staff were competent and not pushy with trying to sell extra etc. This was my first time and I will be back ! And will be bringing my other vehicle also ! I loved the stay in car service and the CSR Jake was informative and not only made this vist easy but pretty cool ! Watching the staff was really neat they all were communicating ,professional,and I even knew what was going on at all times ! I will definitely be back and will recommend this place to all my friends ! Overall I like the efficiency of your service. However $83 with tax for less than 4 quarts of oil is obscenely high. Then to attempt to charge me for an oil plug in my car when I’m already over paying is just plain crazy. I was kept informed every step of the way and thought the technicians were very courteous. The technicians also seem to respect and help each other. It appeared to be a nice working environment. Carlos was professional and friendly. Aaron, Shane and Bill did a good job on the oil change as usual. Easy, quick and convenient! Staff always friendly and welcoming. I was the first customer of the day, so my service started quickly and I was on my way 20 minutes later. Stream lined process. Staff repeat tasks so others can doublecheck process. Communication with staff in lower bay was effective. I was able to sit in my car, never getting out. At $55 for a oil change with a lot of BS charges, I will not be back. My first Honda Pilot lasted 317,000 miles before alternator failure had me trade it in. Never any engine problems while being serviced by the people at this station and all the franchises that preceded it. Oil change every 3000 miles, so sboit 100 of them. Staying in the car during the oil change was very convenient and the attendant communicated with me throughout the process. The guy helping me was extremely nice and helpful and just made the experience so much better. I'm always satisfied with my experience there. The convenience of it and friendliness of the staff never fail to satisfy. When I take my vehicles for an oil change I would prefer to have it done without the additional sales pitches. Quick, professional, friendly service. A great job in every regard. I pulled up and was greeted and directed into a bey within a minute. The two people taking care of me were friendly and explained everything they were doing including the price but without any pressure for extras which was a big relief. Plus I didn’t even have to get out of the car! I was in and out in fifteen minutes and was so impressed! I will definitely be doing this for the foreseeable future!! I loved how fast and professional they were and the staying in the car is great. Everything went smoothly. Only issue was the wait in line. Attendant was courteous and informative. Corlos and his assistant they a great job ,making sure that the car services were done efficiently. Awesome service - very quick and I enjoyed being able to sit in the car while they did the work as I could see what was going on. Additionally, everyone was very friendly and professional, and explained what was going on. It was a good experience. Nice to not have to get out of your car. Shame was very knowledgeable and helpful. Explained everything to me. Very nice young man. My oilchange was on January 26th as of February 3rd my oil plug was loose, my heat shield was loose, I now have oil in my engine compartment and air filters, and I'm down 3 quarts. I’ve taken my car there before. They are friendly, kind and knowledgeable and I never feel pressured. Great price, customer service and quick service. Will be back! Service Representative Carlos was very nice, informative, friendly, courteous and a great reflection of the company. Very well trained and service oriented and customer focused. Everything impressed me from beginning to end. Thank you! Quick, professional service. Great job overall. The team worked great together. Bill and Shane were very fast and thorough. Explained everything and didn't try to take advantage of a lady in the shop. I will be back. The staff was really knowledgable and friendly. They did a thorough and quick job. The person who oversaw my oil change was extremely friendly, well-spoken, and attentive. I’m a regular at this location, for many reasons- great customer service, service to my vehicle is always perfect & I trust their advice. I always leave satisfied! Thank you! I didn't have to wait to start. Once started the job was completed very quickly. The staff was courteous and not pushy. Team member William was excellent and took his time to explain everything he was doing. The employees of this store were awesome. Quick, efficient, explained a few things and overall made it a great experience! I do not like the high cost, however, I need to be able to pull in and get a quick oil change whenever I can squeeze it into my schedule so I love that. The employee who worked with me was very clear and the service was thorough. The assistant manger is by far is the reason why I have continued to come back time and time again! I just recently went in for an oil change. He greets me so kindly and a big smile every time. He remembers me when he sees me and goes above and beyond with customer service! He easily answers any questions I have. He’s absoloutly amazing and I really appreciate him. My ford acts up a lot and he’s always there to help haha! THE JEEP RENEGADE REQUIRES REMOVAL OF THE SKID PLATE. NOT EASY. THE STAFF DID THIS QUICKLY AND WITHOUT COMPLAINT. THE GUYS AND GIRLS THERE ARE SUPER FRIENDLY AND HELPFUL. Everyone is nice and they always do a great job. I had a time crunch and was able to get in and out very quickly, so it met my needs perfectly. I was impressed with the courtesy and respect from the staff, especially the request to reach in the car to turn on something or check something, the request before they reached in was very impressive. Once I was seen, process was quick and efficient. Friendly and knowledgeable staff. I had never had this kind of oil change done to my vehicle ever; so I was a little unsure of the process. But now having done it. I feel very good about the team that worked on my car and the overall service was professional and quick. Good job, two thumbs up Valvoline Doylestown. Very thorough, friendly, and convenient! Very professional, courteous service and I was in and out in no time at all! Wonderful experience! The extras - filling various fluids. The staff seemed knowledgeable and worked well together. Staff was friendly and explained the process very clearly to me! Carlos was awesome. Walked me through every step. Kind and helpful. The entire staff was courteous and friendly. They also worked very quickly to get the job done. They were also very thorough with the courtesy checks. The staff was friendly, courteous and answered all questions that I had. Tommy and the other staff were incredibly quick, efficient, knowledgeable, and polite. They were also impressive with their high energy. I think the gentleman that helped me did a great job from start to finish. He was very clear and professional. He was very respectful of my time and super friendly. quick, efficient, friendly. A new lady who was working there was very earnest and energetic, trying to learn the ropes. Quick service, could see what they were working on from the car. Asked me questions, no pressure. Excellent customer service.Greeted with a smile.Extremely satisfied with personnel and service! Because I never use the term “highly satisfied”. The staff did a good job. I thought the staff was very friendly and professional. I like not having to leave my car. Easy and fast. Employees were wonderful. Went above and beyond what I expected. They were extremely busy when I went in and Bill and Val got me right in and out in no time. Will be back! The professionalism and friendliness of everyone working there today was extremely satisfying. They were all very knowledgeable. Overall excellent service. Very informative staff. The people that work there are very nice and very honest! I have taken two vehicles there and I was told they were not ready for an oil change! They could have easily done it without me knowing! This also happened to my mother! They always go the extra mile and check fluids and tire pressures! Nice to find people you can trust with your vehicles! Will definitely go back! The techs were very good, Car was taken care of well, and services were explained effectively, including other recommended vehicle care needs available. My service was timely and efficient. The only thing that could’ve used improvement was when the assistant manager suggested a product for my car. He did not really explain much about the product, what it was, or how it would help my car. Everyone was very friendly and kind. I appreciated their thoroughness. The staff at the Doylestown location is fast, efficient, knowledgeable, and friendly. I always feel taken care of when I go there and confident in the service they’ve provided. The people were very friendly, and they clearly explained everything they were doing. It was quick, there was a lot of technicians to get me in and out as soon as possible. It was just a painless process. I had never been here before. The assistant manager took care of me and was friendly and knowledgeable. I stayed in the car the entire time. I loved that fact that it was quick. The only area that was of concern was that the cost of the oil change was much more expensive than other places I have been to in this area. The staff had a clear understanding of what service I was there for and did their individual portion of my service quickly, professionally and pleasantly. I found the whole experience to be refreshing as in reference to your competators. the guy who greeted and took care of my car, frank i think his name was(in terrible w names, but i'm pretty sure he was in charge) was awesome..super knowledgeable and went above and beyond..that guy is you all's best advertisement..give dude a raise and a promotion. Incredible team effort - all sorts of checks/acknowledgements so not one individual can overlook something. FAST too! Ive used Valvoline in the past down south when I lived in Nashville.Valvoline is cheaper the Jiffy lube with equal or better serviceAnd they also offer coupons for future oil changes. Very courteous and professional! Took care of my car quickly and efficiently! Amazing customer service as always. I never feel pressured to buy more, but do under the trust of the mechanic. And help steering over the bay is always appreciated!! I am always happy with the convenience and ease of getting my oil changed here. This time I also needed a new headlight and find it so great to have a simple one stop shop for these car maintenance tasks. I regularly recommend to friends. I feel you should market more to moms with little kids because not having to get my 4 year old, 2 year old, and baby out at all is huge! The tech was very professional and courteous. He was informative and speedy. Love the drive in and stay in your car while they change your oil. Just Great service! I’m a regular at this location. Their customer service is always on point along with recommendations & maintenance to my vehicle. In fact after this last visit-car runs like new again- thank you!! The manager was over the top friendly. I love that you don't have to exit your car to get your oil changed. All oil changes should be this easy and convenient! The overall service was fine. The techs informed me as they worked as to what they were doing and all seemed very prolific at their work. I did have to wait a short while as the techs finished a customer before me and it did take someone a few minutes before they checked on me when I drove up.I do plan on returning for my next oil change and possible maintenance. Great customer service. Friendly staff. Did not wait long. There are many places that can complete an oil change, but I will not go anywhere except Valvoline from here on out. When I pulled in, my son was crying in the back seat. In my rush to get him out an calm, I dropped his pacifier on the ground. A minute later an employee came to me with a cup of water and a napkin to wipe off the pacifier so I could calm my son down. He did this without my asking or prompting. It was just out of the kindness of his heart. Additionally, he volunteered to take my garbage from me to throw it out. The other man working on my car and showing me services/prices was incredibly patient as I dealt with my crying son. He waited for me—not rushing or pushing me at all—before he went over my options. I am absolutely BLOWN AWAY by the kindness these men exhibited. I passed this information on to two of my family members already, and they agreed that Valvoline will now be our go-to place for an oil change. Super friendly staff! Very pleasant! Made getting an oil change a great experience! Tommy always greets me by name, always provides quick service. The staff at this unit is professional, friendly, and knowledgeable. I have already recommended this shop to others. Very pleasantly surprised! Outstanding service. Very competent. Very respectful. Very friendly. Gained my trust. Will use the shop going forward. Thank you. The service was quick, and the staff was very communicative. Polite people. Not too pushy, very knowledgeable. Carlos was very pleasant and explained everything at each step while I was sitting there. I always enjoy the courtliness of the staff and on this particular visit, Carlos was very helpful. His daughter is turning 2 tomorrow, so he was in a great mood! Because the crew is extremely efficient and knowledgeable they explained everything in great detail! Especially Carlos! I was greeted promptly and asked if I was ever there before. I had never been there so the person explained their procedures. When a bulb was out he told me how much it was and asked if I wanted to have them replace. He showed me the filters which were ok and I liked that he showed me the oil level after the oil was changed. At first I thought it was odd to drive my vehicle in and stay in while the service was performed but it was nice. Very polite and seemingly experienced staff. I take all five of our cars there and will continue to do so! The customer service was terrific! Loved the personnel. The turn getting into/out of the bay was tight for my pickup truck, and I thought the prices were high, but the convenience was nice so I guess it's okay. I would like the price to be a bit better though for the value. This was my first time and was a little nervous when I drove in to the bay. My technician was amazing. Explained everything that was going to happen and also throughout the process. I wish I could remember his name because he was absolutely wonderful and the main reason I will be coming back and recommending your store. Kudos to him!!!! I’ve been taking my vehicle to this location for a year now. They’re always consistent, great customer service/attitude and service to my vehicle. I can always count on them.Thanks again! This was a purchase made online via Groupon. I thought that I already paid in full for the service, but to find out there were extra charges like filter charge, extra fluid charge and taxes. Just a very easy transaction! Great crew at this location. Tom, the manager always has great customer service and is very helpful. He even offered the fleet program because we have company vehicles that come by often. I recommend them to a lot of people! Everyone was friendly and knowledgeable. Once inside the bay, service was completed thoroughly and promptly. Bill Foley always does a great job when I come in for service. Very knowledgeable and always lets me know what the recommendations are for the mileage on my truck. Very quick service. Super friendly staff. Reasonable price. Manager and techs polite, knowledgeable and diligent. Bill was very friendly and knowledgeable. He treated me like he knew me forever. Haven't been to this shop in a little while but he provided a great service. I'm a returning customer. This location has a very good crew. I'm always pleased when i see the same guys working there. Car takes 0W 20 motor oil. Difference between the conventional oil change and the next tier up is much higher. Having worked for Chevron for ten years, including in the oil additives group, I know the difference between a 5W 20 and 0W 20 oil is not as large the difference you are charging between the service levels. It is all marketing. will probably look for another quick oil change center because of this fact. Great experience. Carlos and the team where all great. Very fast and efficient. Let me know extras needed but no pressure or upsell. Will definitely return. The staff are always extremely kind and knowledgeable! They took me in so quick because they knew I had an appointment after. They were so friendly and polite. Very efficient!! Representative knowledgeable - articulate and very accommodating. Carlos recognized us from previous visits - we have a lifted pickup and a lifted jeep so our vehicles are very memorable - and treated us like old friends. Carlos was fun to talk with and did a great job. Quick and easy. Didn't have to get out of my car. IT WAS FAST. THEY SEEMED TO KNOW WHAT WAS NEEDED. I PULLED IN ON THE WAY INTO WORK. HAVE TO GO BACK TO TAKE CARE OF MY ANTI-FREEZE. WOULD NOT HAVE KNOWN THAT OTHERWISE. Tech Carlos was excellent. He was knowledgeable about offered service and was quick to get my car in and out. The staff was extremely knowledgeable and friendly. The service was great and fast. It was just a pleasant experience. Staff was very friendly and explained everything that they were doing. Made recommendations but did not pressure. Did not have to wait and was done within 15 minutes. Always receive friendly service. Tommy the mgr always remembers my name and I never feel pressured. I usually travel out of my way to go to this particular store because of the treatment I receive there. The manager and the technician I interacted with were both knowledgeable and friendly. They advised on the best management of my vehicle without any excessive salesmanship. They provided fast friendly service and communicated what was done and what was needed without forcing me to take the additional service. Service tech was very nice and kept me informed as the work progressed. I liked the people who waited on me. I felt they were honest. The friendly customer service with no pressure to purchase additional services. the quick time it took for all service to be completed. Daniel and the other service staff were excellent. Made my visit very pleasant and quick. Also solved a rear wiper problem for me which had been a nag. Thank you for the great service. The guys did the job quickly and efficiently. They seemed to know their jobs. Nothing really the guys took great care of my vehicle and service was prompt. It’s an oil change. It’s not like they painted my vehicle. Just an oil change. I especially appreciated MANAGER Thomas Knox's friendly and professional demeanor. Despite the crippling heat, Thomas was happy to do his job and made sure I was informed every step of the way about what he was doing. This was my first time visiting a Valvoline service center and I will definitely be back to this location. Fast efficient and no waiting even though they switched out my power steering fluid as well as the oil change. They also asked to check the coldness of the AC which they had just recharged in the previous visit ensuring that it was still nice and cold. it was quick easy and all were polite. The staff was incredible and very knowledgeable. Kind and clear when explaining to me what was happening with my vehicle, as well as the pricing. I will for sure come here again! Great staff, friendly fast low pressure service. The way it should be. Friendly service staff, prices and options explained very well. Service complete in a timely manner. All staff very knowledgeable. Everything was completed in the time I expected and Tim found a spare piece of hardware I was missing. Daniel was professional, courteous and very knowledgeable. Immediate, friendly and efficient service with full explanation of everything as it happened. Tom was my service person and he was wonderful! I was offered a coupon on a service the technician determined my car needed. The service they provided was outstanding. Bill recommend I recharge my AC on my last visit but I didn't have the money. I came back 2 weeks later and Bill and Shane fixed my AC. They worked great together. Well first I want to say that I think the manager did a good job and I was really happy that he and his crew did not put on a heavy sales pitch for cabin filters and stuff like that. I have experienced that before and it is a turn off.I am not thrilled about staying in the car during the service. I liked it better before when you had to wait in the customer lounge. Honestly I don't like hearing them yelling out technical terms and numbers to each other while I sit in my car. It reminds me of the Seinfeld episode about the nail salon employees talking about the customers in front of them in another language. Very professional and friendly staff who explained everything very clearly and the whole service was very efficient. It was more than I usually pay for an oil change, than their was the upsale...was hoping to sit outside and enjoy the sun, but I had to stay in my car for drive thru service. I would have rather not been in car for oil change. Great service, Performed multiple services in a timely manor. the manager,Tom, was very friendly and helpful. I was extraordinarily impressed with the young man who serviced my car. He was polite, knowledge, friendly and extremely helpful. He answered all my questions and helped me really understand what my car needed and why. It was pleasure to meet him and learn things about my car I never knew. I felt comfortable and respected. I received service immediately by a friendly and knowledgeable worker. The staff knew their rolls and I was finished in a reasonably short period of time. Great customer service and very speedy oil change. Tommy the manager at the doylestown store was awesome. Professional,helpful, and happy. It is awful when you go some place to have your car serviced and the person is rude or not helpful or just doesn’t want to be there. Tommy was great and I will definitely go back. There was no wait and the work was done quickly. the employees were polite and knowledgeable. The staff was quick, efficient, and very friendly. They ran everything by me before they started working and kept me updated along the way. They gave me suggestions and options without any pressure and treated me like part of the family. They even recognized me even though I pulled up in a new car about 9 months since my last visit! Guys were very good and also personable. I’m very satisfied with my experience and the “team” at this location. They work together well and are time efficient, honest about the service my car needs/ *my car always seems to run better after my visit- Thank you! Asked if a new cabin air filter could be installed and the techs got it in my vehicle quickly and at a low price. Staff was friendly, service was quick, pricing was reasonable. Bill the service attemdent ,did an excellent job of explaining ever precidier that was performed. Much more expensive than where I usually go in Souderton, but didn't have time to drive there on this occasion. Add-ons suggested (e.g., air filter, wiper blades, etc.) were also more expensive than I am accustomed to. It was a easy painless process. The employees were nice and easy going. Great customer service, super fast and friendly employees. Price is much higher than expected. First time trying Valvoline. Crew was extremely considerate and thorough. Service was very convenient and quick. Will recommend and will be back. It was quick and painless. No lines, no sitting around, and I didn't have to drop my car off for three or more hours. The time I was sitting I was being informed and assured. Outstanding idea and service. The staff was professional and efficient in the servicing of my car. There was no waiting at the time I went for my oil change. the inspection of my car also was completed covering all the key operational elements of the car. Very professional operation. I was very pleased with the entire experience. Everything went very smoothly and the staff was very knowledgable and friendly! Service was quick and easy!! Efficient drive through service, very courteous and knowledgeable staff, liked the tire pressure and other 'checks'. Advised me of air filter replacement soon, no pressure to buy today. Quick service and the gentlemen who changed my oil, checked all my lights, and fluids and replaced my fluids that were low and added air to my tires. He was pleasant and very kind. I will definitely return for my next oil change. Nice job guys! The technician was friendly and explained everything he and his team were doing. No issues. No waiting. Very friendly staff. Easy explanations of services. Felt confident with the work that was done. They were the same people working there and I recognized the service attendant who was helpful. They told me what they were going to do and what they were doing during the oil change. Staff was courteous, professional, and explained everything. They did not try to sell me things I did not need. It was a quick and easy experience. Fast, friendly, convenient, says it all! I have been getting our oil changed at Valvoline for 2 years now, and the reason I go back is because the service is very good, including the customer service. The technicians are very friendly and also clean looking in their uniforms. My husband does not take our vehicles to get the oil changed but because of my experiences he is very pleased, also. Total preventive maintenance care.It's like having your own pit crew! The techa do a great job providing personal service with no sales pressure. I’ve been other places & the service/quality is the best- they are honest & an efficient team.Thank you! The people were nice. They checked out everything I was concerned with and made changes/suggestions accordingly. As usual my experience was all that I expected - quick, friendly & fairly priced. Carlos, the technician I was speaking with, was incredibly personable and truly seemed to care about making the experience more than just a one-time event. I will definitely be returning to the same facility in the future. Friendly staff and speed of service. During my visit I was in bay 3 with Carlos who was doing my service I must say he was AWESOME great attidude very happy go lucky. He made my expericnce at this location amazing. Not only I feel I got the best customer service. I feel like I gained a new friend at the same time!!!!! Please give this man employee of the month!!!!!! Good group of guys working at the Doylestown PA location. Polite, friendly and professional. Price is to high. Even with the 8.00 coupon it was still more the other simular places. Also sat in my car in your cold garage while waiting with car heater off in winter. Coffee and a warm (or cool) seat used to be nice. At Kmart, I can shop and/or eat. Also have staff enunciate so we can understand them. They talk to uslike we are used to their voice and service slang. I kept asking them to repeat and it didn't affect the next words they spoke (like it was my problem). I came at 5:30 and they were closing at 6 and were still able to service my car. I was very pleased with the service, I was putting off an oil change because I didn’t want to sit in a waiting room with my 2 toddlers trying to keep them from destroying everything in site. Being able to keep everyone in the car was very convenient. The man who took care of me (can’t remember his name now) but he was very professional and didnt try and sell me an air filter which made me very happy.The fact that you offer a military discount is very nice too- overall I will definitely be back. Bill was the person taking care of my car. He is professional, courteous and thorough. He seems genuinely nice and attentive to my needs. I asked some questions and he explained clearly. I liked that you could drive in and not get out out and sit in waiting room I was on my lunch hour so this was super convenient! The manager and staff were very friendly and explained all that they were doing.Thanks! Came in just for my tires to be checked, they double checked my oil and added washer fluid in there, most honest shop I’ve ever been to. The technician was very communicative about what was going to be included in the service and treated me with respect. Best oil change experience I have ever had. First time at this particular Valvoline and I will never go to another one. Bill and the guys were great. All went well. No complaints. Great courteous, polite staff. Very positive and polite. Got in and out very quickly. Employees are courteous and knowledgeable. I was met within seconds of my arrival and directed to drive into the middle bay. I told the customer service rep what I wanted and he reminded me of the oil I used previously and if I wanted that oil or something different. Her did not pressure me to upgrade. He reminded me that I had the air filter changed the last time you changed my oil. He was respectfully and responsive throughout. Once finished, he reset my oil change message. Also, I gave the coupon I had after my service was complete and he entered the coupon with no questions asked. The staff made everything easy and fast. Expected a wait on Saturday morning, but there was none. In and out in 20 minutes. Coupon price was great. Mechanic showed me record of oil changes, etc done on my car thru CarSense - falsely reported that my air filter etc hadn't been changed since 2016 = both were changed in mid 2017. I didn't need either one. Yes, I should have known better not to trust. The cost of the air filter was almost $50. Have been told this is much higher than the average. Quick cheerful service. Guys that work here are very respectful. The service representatives were extremely friendly and professional. All four introduced themselves and told me what they were doing at each step. Pricing was thoroughly explained. Everything was conveyed to me about what they were doing. The total time it took to perform this service was minimal. I was greeted promptly, did not have to wait for service and was out in 10 minutes. This is the first time I stayed in my car for the entire service which was different and positive. I was able to get my oil changed on my lunch hour. The multi-point inspection was a good check on key systems. Also had tire pressure adjusted, as I knew it needed to be. Exceptional, knowledgeable, and thorough customer service. The gentleman were professional, friendly and efficient without pushy or trying to sell me more than i needed. I will definitely be back next time. Bonus: I didn't even have to get out of the car! Not only was the service impeccable mechanically speaking, the customer service I encountered was exceptional. Having been in customer service for over a decade I’m aware of the extreme impact guest service and employee/guest interaction have on a brand. While there’s always room to grow those at the top of their game will exponentially assist in the growth of business by turning new customers into repeat customers.For example, Trevor is the mechanic I had the pleasure of dealing with during my visit today. Initially I choose Vavoline solely due to location convenience. Long story short I needed an oil change today with no time to go to my local mechanic. I had no plans of returning unless i found myself in the same predicament simply because of the price difference. With that I’m happy to say as a result of today’s interaction with Trevor I have been converted from an “only option” customer to repeat customer. I would most definitely categorize that as a success! I do hope Trevor is recognized as he is an absolute asset to Valvoline! Was told my serpentine belt was fine after Ford said it needed to be changed. Appreciated the honesty. I am a long-term customer. I have two cars and have been using your service for quite some time. It is a service I trust. The team worked very well together and were courteous, kind and knowledgeable. As soon I pulled up to the sign to stop an employee was there. Every aspect of the service was awesome. The employees were very friendly and helpful. What a great experience just getting my oil changed. Tom was very professional and really knowledgeable. You don't always find that anymore. The staff was knowledgeable and very friendly and they got me in right. But the price paid was a hit too high! Professional staff, fast service, pleasant experience. Will be back! Great staff. Carlos always takes the time to have as much small talk as possible. Helps me feel like more than just another car rolling through. It was quick and a quality job. Customer service was best I've encountered in most establishments. Service guys were friendly and knowledgable. The service was quick but thorough. The staff was very friendly and helpful. It was a fair price and I loved not having to get out of the vehicle bc I have small children that don't do well in waiting rooms. The technicians that worked on my car did a great job a communicating everything and completing the service as quickly as possible. I love the convenience of just staying in my car. Very nice and competent staff. The employee I worked with was very friendly and helpful. I was in and out rather quickly and he helped me with other issues I needed done with the car. Staff was very helpful and recommended what service should be done to my vehicle. Didn’t push any unnecessary services. It seemed the prices were a little high. The service was quick and personal. They took me in instantly and the service attendants were kind and kept me updated about the process as it happened. It was a cool drive-thru experience. Carlos was not only professional in his work and recommendations but was also very personable and accommodating, as needed. I got excellent service for the price and was in and out in the matter of 20 or so minutes. Would highly recommend. I didn't have to wait and the service didn't take long either. Very convenient way to get an oil change. The cost for just the oil change was okay even at 60.00 plus the extra oil charge, its higher then what I would call normal for non synthetic oil. Then I was up-charged 9.00 for an oil filter I can buy for 6.00. The tech who was working under my hood at first tightened the filter then had trouble getting it out when he realized he was turning the wrench the wrong way?? For me the worst was the oil that was spilled on my engine and all the grease and oil all over my paint on the hood and front end not to mention when my fluids were topped off I watched the tech spill on my fenders. I got home not to happy at all.. I went to try this after seeing an advertised cost of 29.99 and leaving my total was 78.83. I keep my car clean and the mess and care was unexceptionable to me. Out of all of the other times I have had to go and get an oil change, I have never had such an easy, quick, and friendly experience. I will not be returning to PepBoys for my oil changes and will continue to come back to Valvoline. Time for service took longer than communicated to me. The staff are really good guys....hard working, professional and down to earth. Carlos was very professional and friendly. Great hire for Valvoline. All the techs are highly professional and friendly.I enjoy taking my cars to them. It's like having a personal pit crew. The service was quick and efficient. Usually when I go elsewhere, I always feel pressured to give in and get additional services, and often without much explanation. At Valvoline I never feel pressured, and always have a full understanding of the service before I make my decision. Convenience - no wait - didn't even leave my car! Very quick and convenient. First time there. I’ve passed it many times because I work in doylestown. It was very very convenient. Look forward to bringing my other car there too. Carlos was great. He was friendly, helpful and professional. Quick in and out, little to no waiting. I liked that I didn't have to leave my car. They were very professional. Satisfied customer!!! Everyone was very friendly and helpful. Service was quick and thorough. Service was great, but I don't like feeling like each time I visit I'm told I need additional services on the vehicle. Very kind staff, gave me suggestions for other issues involving my car that they just can not service. The tech who helped me out was Carlos, he impressed me and was a great help. He was polite and courteous, an oil change is an oil change, its the people who help you through the experience that make it or break it. Doylestown does a great job and with the online coupon I got a highly competitive price. My local location has always done great work and I trust the quality of the staff to treat me and my car well. Friendly knowledgeable staff answered any and all questions. And gave me advice on what to do to better the performance of my SUV. Very Good Attitude and Customer Service from staff. It appears the team works well together & there is overall good vibe - positive, welcoming & professional. Work performed in timely manner, and representative advised of needed repairs -service items w/o pressure, and provide good explanations. The manager was professional, clear, and completed the oil change quickly. Fast Courteous service Knowledge staff. nice fellows. very good crew. Service was quick. Employees were friendly, engaging, and thorough. Everyone was very friendly! They all worked as a team! No one was standing around. There was no pressure to purchase other items. I did buy a bulb for my turn signal. My invoice was clearly explained to me! I will be back!! The Tech was Knowledgeable and Friendly. Carlos was friendly, very professional and made me feel at ease. I thought it was great that you actually sat in your car while they performed their services. Always very willing to tell you what they were doing. Will definitely be using their services again and will recommend them to others. The service was great - fast, helpful, informative. Historically, I have not enjoyed my experience at valvoline because they always try to get you to buy something. It was nice to feel relaxed and have the service I wanted done without having to say no to several other things. Staff is very thorough and services are quick.